In L. Timmel Duchamp's "The Man Who Plugged In," Howard Nies becomes the first male to plug into a Siemens Carapace. And as an ad in the February 2013 issue of The American Journal of Obstetrics and Gynecology notes, the Siemens Carapace is "a prenatal cradle of caring" at the cutting edge of technology, "made of the finest, strongest, most lightweight materials ever produced. Its clean, round lines and soft, silvery matte finish can't fail to reassure both the parents and the gestational carrier who wears it that the child within is getting better care and protection than any naturally gestated child." Need a quick dose of weird, brainy science fiction but don't have time to commit to an entire short story collection? Then consider a new kind of book, from Aqueduct Press, which you might call a short story single, with an A-Side and a B-Side (though both stories get an A from this reader). 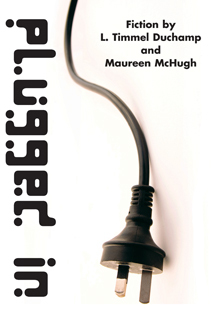 Plugged In contains "The Man Who Plugged In," by L. Timmel Duchamp and "Kingdom of the Blind" by Maureen McHugh....Highly recommended.